There's a new Zelda game coming! And while at first glance it appears to be following in the artistic footsteps of its predecessor, Twilight Princess, first glances can be misleading. You quickly notice that Skyward, while superficially retaining the design style of Twilight, has a cartoony sheen, giving it an appearance that sits halfway between the Wii's Zelda title and Wind Waker. Or, as series creator Shigeru Miyamoto would have you know, is in fact inspired by Impressionism, and the works of Paul Cézanne. It's a sign that Nintendo perhaps regrets going for the dirty, realistic look of Twilight Princess, particularly given that the Wii's hardware wasn't really capable of doing it justice. An even more telling sign, however, can be found in the look of Link himself. Look at his boots. His tunic. This isn't the Lord of the Rings extra we saw in Twilight. 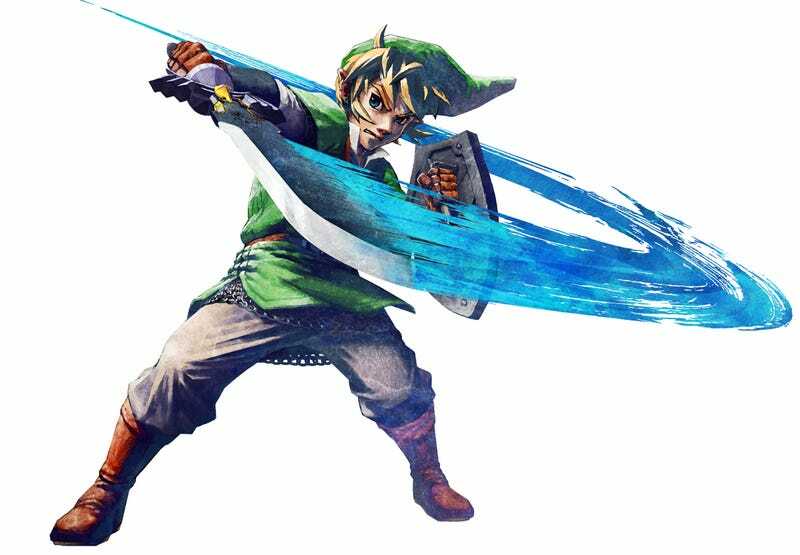 That Link was steeped in practicality, with his leather straps and sewn tunic and intricately-patterned arm guards. Skyward's Link is a throwback to old Link. His tunic isn't worn, or tattered. It's a bright, clean shade of green! His boots look like something out of Ocarina of Time, and his heavy chainmail and simple adornments hark back to even earlier games. While it's a shame we've lost Twilight's Link after only one full game (he was a great example of how to modernise a character without losing sight of its roots), I can see where Nintendo is going with this. You could say Sykward's Link is a statement of intent from Nintendo. As if the company is saying that after years of Nintendo-bashing from its former fanbase, all it takes to wind back the clock to happier times is to present us with a Link that looks like he's from a game where you wind back the clock.